I was pretty excited about the Rink of Dreams opening for the season last week! If you ask me sometime in February (when it's -40 out) why I moved to Ottawa, I will cringe and say I don't know what I was thinking, but in December, when skating season starts, I'm pretty happy about it. 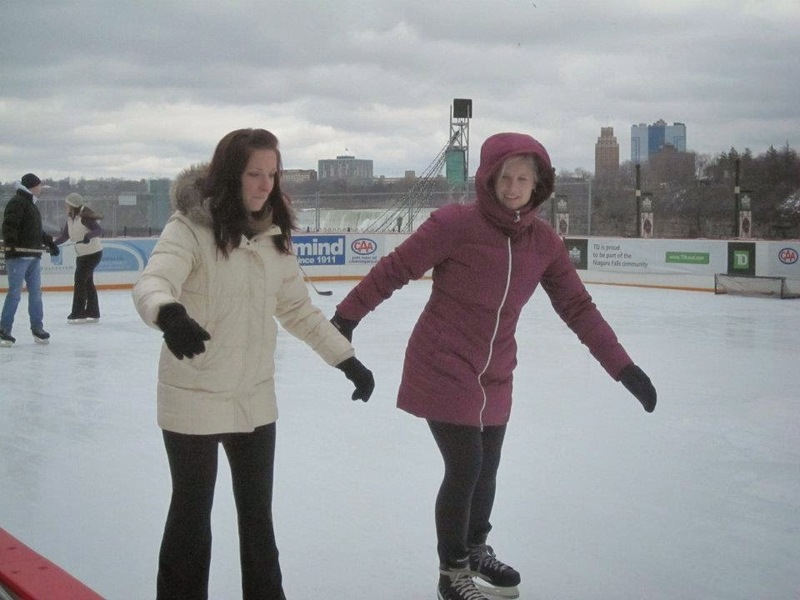 The photo is one of me and my friend Leah skating in Niagara Falls last winter. I often get bored of doing cardio in the gym, and skating is a great way to switch up a workout. Leisurely skating burns approximately 5 calories per minute, which puts it at around the same caloric output as moderate stationary biking in the gym. Compared to other low-impact activities, skating burns more calories than moderate walking, but less than the elliptical. Wear layers that keep you warm, but allow you to move efficiently. I recommend a long sleeve workout (my personal favourite is ACX brand from Giant Tiger) shirt under a fleece sweater (love this leopard one from Old Navy), and a parka. A warm pair of tights (these Under Amour tights are expensive, but a good investment if you spend a lot of time outside) and snow pants will keep you warm but won't restrict movement. Walk to a local rink for your warm up. Keep in mind that stretching before outdoor skating can be a bad idea since it is so cold outside, the muscles will be cold too. Never stretch a cold muscle! Warm up with a fast paced walk instead. Skating a fun way to include some extra cardio in your day, and it is low impact! Enjoy!